Cell line selection is important to any pharmaceutical company’s development pathway for biological compounds (1). In cell-line selection laboratories, many different, slightly variable cell lines are tested in parallel for desired characteristics. Candidate cell lines are chosen for further development on the basis of their performance in basic tests of critical quality attributes (CQAs). Historically, such cell lines were selected in large-volume containers because it was necessary to have sufficient volume in culture to allow repeated sampling without damaging the culture (2). In new, small-scale bioreactors with 10-mL total culture volumes, removing even half a milliliter five times for parameter testing represents a total loss of 25% of culture volume. Such a change will dramatically affect the behavior of cells in culture (2). Use of fluorescent tests has been a standard in the hospital diagnostic market for many years. The system was adopted in hospitals because of its accuracy and reproducibility (3). The diversity of tests available using colorimetric, UV absorption, and turbidimetry has surpassed the number of tests available using older methods. In addition, the different diagnostic laboratory tests use only very small sample sizes. Primarily two technologies are used for chemistry analysis in pharmaceutical research. One is enzyme-based testing seen on chemistry analyzers such as the YSI 2700 biochemistry analyzer (Yellow Springs Instruments) commonly used in pharmaceutical production testing. In that system, a small sample of cell culture media (usually 25 µL) is aspirated into the instrument, either manually or automatically, and passed through a filtration membrane. Media comes into contact with a different membrane impregnated with a specific enzyme directed to the analyte of interest. When a sample comes into contact with this enzyme, the analyte is oxidized, forming hydrogen peroxide in direct proportion to the concentration of the analyte in the original solution. The concentration of hydrogen peroxide is detected by a sensor and the readout indicates the original concentration of analyte. The YSI system is fast (most readings can be completed in about a minute) and requires only a small sample. The adaptability of the system for small-volume testing, however, is limited because a sample must come into contact with the membrane and biosensor, neither of which is configured for the plates typically used in cell selection. Moreover, the membranes are subject to coating by the analytes being tested and must be cleaned and replaced fairly often (4). Biochemical methods are a second suite of tests typically used for chemistry analysis. Related instruments include the BioProfile series (NOVA Biomedical), which use several different technologies for measurements depending on the analyte being investigated. For pH, pCO2, NH4+, Na+, K+, and acetate, potentiometric-based electrodes are used to determine concentration. In this test, the charge that develops on an ion-selective membrane is proportional to the concentration of the ion of interest. Amperometric electrodes are used to gather readings on pO2, glucose, lactate, glycerol, glutamine, and glutamate. An amperometric electrode consists of a platinum electrode covered by an oxygen-permeable membrane. In the membranes for the glucose, lactate, glutamine, and glutamate tests, an enzyme present in the membrane oxidizes the analyte, producing the reading on the oxygen-sensitive electrode. A photometry test is used for phosphate and glycerol. The amount of transmitted light is proportional to the concentration of the analyte in a sample. The advantage of this system is speed; all tests (~10) can be fully analyzed in three minutes (5). Sample size, however, is 500–800 µL, which causes problems in small-scale tissue cultures. It also, like the YSI analyzer, has issues with membrane coating leading to degradation of accuracy, particularly using very dilute samples. The use of clinical chemistry analyzers in pharmaceutical chemistry analysis is still relatively new. In these systems, a small amount of medium (usually on the order of 2 µL, but it can be reduced to fit available sample volume or reaction volume) is mixed with the appropriate test reagent. It is then incubated for a designated period of time, and a light-sensing technology reads the results. Light absorbance at a particular wavelength or the optical-density of a sample is proportional to the concentration of the analyte of interest. Advantages of this test are its small, scalable sample size and accurate results, even at very low concentrations. The disadvantage is time taken to complete an analysis. The test does not involve membranes, so variability in accuracy over time is not an issue. Also, the presence of cells in a medium does not affect test results. The use of diagnostic reagents to test cell culture chemistry lends itself well to batch testing. Batch testing analyzes many samples in parallel, which minimizes the effect of time delays inherent in the testing. Hospital diagnostic laboratories test thousands of patient samples per day, so it is only natural that they would adopt this method of testing. For pharmaceutical research laboratories, the drive for batch samples is much lower. So not be as much benefit is seen in parallel testing of multiple samples. In cell line selection, however, batch sampling is common practice, with hundreds of tests being performed in parallel. e follow-up article). Clones that produce high amounts of antibody can be selected early in a development process, saving time and money. Table 1 and Figures 1 and 2 compare UCA to a more traditional chemistry analyzer using a concentration of glucose in test media. As can be seen, the accuracy of the traditional analyzer, although comparable to that of UCA data at the full concentration, is significantly reduced at lower concentrations. UCA is based on simple chemistry, the same chemistry used in hospitals to conduct tests and ensure accuracy. This chemistry — be it colorimetric or optical density in nature — works the same whether you use 2 µL, 1 µL, or 50 nL. The measurement is the same because the chemistry is the same. Because of this scalability, information about cell culture chemistry previously available only farther downstream in a process is now available during original cell selection. More information from a screen means less time spent pursuing false positives, higher productivity, and lower cost. Biopharmaceutical companies are seeking ways to scale down cell line testing traditionally conducted in large-volume bench-top bioreactors to levels more economically feasible for conducting thousands of tests in parallel. Products such as the ambr microbioreactor from TAP Biosystems address this issue, reducing bioreactor volumes from 50 mL to 15 mL. At such levels, however, more sophisticated cellular chemistry testing is difficult because the volume needed to conduct testing represents too large a loss to overall culture medium. Multiple tests for cellular chemistry are on the market, each with advantages and disadvantages. The volumes are very small and can be further reduced. Using light-sensor technology, reactions can be run and read in the same small-volume microplate format common for cell line selection. In addition, tests are extremely accurate and results are highly reproducible. Such characteristics lend themselves well to cell line selection because screening in duplicate or triplicate slows down throughput. 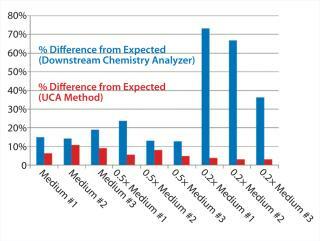 UCA can bring chemistry analysis to the cell-based process development market and gives screeners a new tool for identifying correlation of CQAs to critical process parameters. 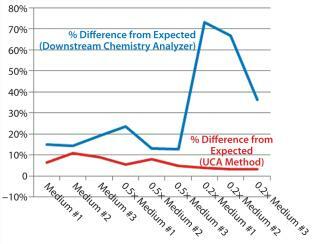 UCA allows further reduction of sample sizes, while delivering data more representative of what is seen in larger reaction volumes and providing information about more parameters for making decisions about which cell lines to select for product manufacture. Daniel Allen is chief technology officer at Scimarket Technologies, 311 Milton Road #73162, Durham, NC 27722; 1-919-593-1426; daniel.allen@scimarket.com. 1.) Brown, SM, and M Al-Rubeai. 2007. Selection Methods for High-Producing Mammalian Cell Lines. Trends Biotechnol. 25:425-432. 2.) Guidelines for Maintaining Cultured Cells. 3.) Berger, D 1999. A Brief History of Medical Diagnosis and the Birth of the Clinical Laboratory. MLO Med Lab Obs. www.academia.dk/Blog/wp-content/uploads/KlinLab-Hist/LabHistory4.pdf 31:38-42. 4.) YSI 2700 Select Biochemistry Analyzer User’s Manual. 5.) 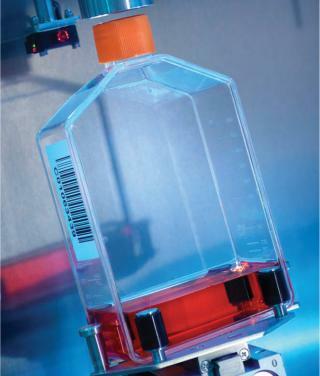 BioProfile Automated Analyzers for Mammalian Cell Culture. 6.) Behjousiar, A, C Kontoravdi, and KM Polizzi. 2012. In Situ Monitoring of Intracellular Glucose and Glutamine in CHO. PLOS One 7.